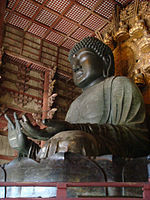 The Butsuzōzui (仏像図彙) ("Illustrated Compendium of Buddhist Images") is a collection of Buddhist iconographic sketches. Originally published in 1690, it comprises more than 800 sketches, inspired by the Chinese style of paintings called Paihuo, with the Buddhist icons divided into five parts and further categorized. In Edo-period Japan the Butsuzōzui compendium was the most widely distributed source for information on Buddhist and Shinbutsu deities. This page was last edited on 18 July 2017, at 14:19 (UTC).